Graham Holland maintained his hold on the event as his three runners all made it through to the decider. In the first semi Pat Buckley's Droopys Davy came back to his very best form as he led all the way in 29.53, followed in by Braveheart Bobby and Clonbrien Prince. Magical Bale made his usual path across for the inside rail, but he couldn't clear Braveheart Bobby into the bend and hit the deck. Pat Guilfoyle reported yesterday that the dog is sore, but should be okay for the English Derby. In the second heat the Holland-trained Clona Blaze took another flying start and was always in front. Kennel companion Lenson Blinder challenged strongly along with Gurteen Feather, but Clona won by a head in 29.72 from Lenson, with Gurteen two lengths back in third. 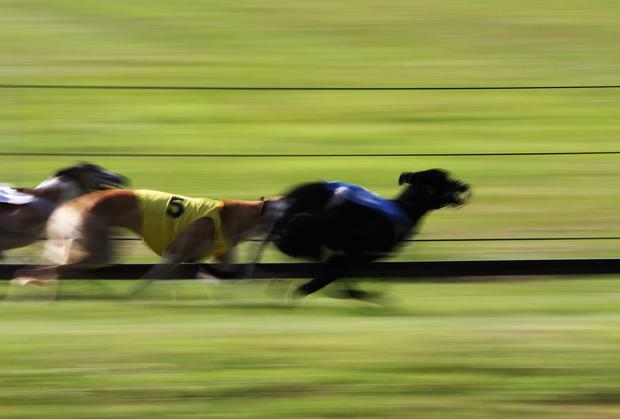 Ladbrokes now make Clona Blaze their 9/4 favourite for next Saturday's final with Droopys Davy at 5/2, They then go 11/4 Lenson Blinder, 4/1 Clonbrien Blaze, 12/1 Braveheart Bobby and 16/1 Gurteen Feather.